Östersund is a city northern central Sweden. It is the seat of Östersund Municipality and the capital of Jämtland County. Thus, the province’s County Governor resides in the city. Östersund is the only city in the province and it is located on the shore of the fifth largest lake in Sweden, Storsjön. The city sprawls along the eastern slopes of the lake and the central parts of the city face the island of Frösön. Today, a sizeable part of the city’s population lives on the slopes of the island that face the city center. The Clarion Hotel Grand Östersund is a modern peroperty set in the city centre, within two kilometres of the open air museum and Multi Challenge adventure park. The hotel offers two dining options: the Restaurang Artist serves a range of local and international dishes in an informal, modern setting with a fireplace and the Lobby Bar offers a selection of light refreshments including tapas. After breakfast, guests can go for a refreshing dip in the hotel's indoor pool, work out in the gym and enjoy some relaxation time in the sauna. Frösö Zoo and Frösö Church are within nine kilometres and the Moose Garden is 17 kilometres away. Östersund Frösö Airport is 10 kilometres away and takes approximately 15 minutes to reach by car. 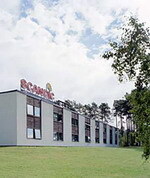 The Scandic Östersund is a low-rise hotel situated three kilometres south of the town centre and 500 metres from the Storsjöbadet Water Park. Guests can work out in the exercise room, which is in the hotel basement and contains an exercise bike, training equipment and a solarium. Children are kept occupied in the playroom next to the restaurant and the sheltered garden has a sandpit, play-house and basketball back- board, as well as a veranda where adults can relax while the kids play. The restaurant is open for dinner and serves a selection of local, national and international dishes from an a la carte menu. Guests can also enjoy drinks and snacks by the open fireplace in the 24-hour bar. Internet connections are available for guests who wish to keep in touch or plan a day's sightseeing. For a family day out, the Storsjöbadet Water Park is just 500 metres from the hotel while, further afield, Frösö Zoo can be found 10 kilometres away. With 126 newly renovated rooms, the Scandic Östersund City hotel offers a relaxing and comfortable stay. Located within walking distance to shops and Östersund attractions, the hotel is your ideal base for exploring this charming town. Arrange a meeting or conference in one of the 6 meeting rooms at the Scandic Östersund City hotel. Dine in the popular restaurant or bistro, and relax with a drink in the hotel bar. Unwind after a long day in the hotel's sauna. By night, enjoy the Scandic Östersund City hotel nightclub, which is popular both with hotel guests and locals.